I was asked to do a live painting during a worship time at my church. We have been focusing on the Psalms during this Lenten season, and this particular week was to be about Psalm 8. I was terrified at first and really up until the moment it was time for me to stand up and begin! When I did though, a peaceful calm came over me and I just began painting. 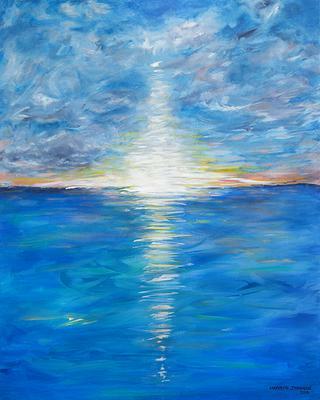 I love the ocean and am basically obsessed with clouds so this scene spoke to me when listening to the Psalm. It was a blessed experience, and I'm pretty pleased with the end result. Hope you enjoy it as well!